Welcome to my monthly garden guide series for Adelaide and other Mediterranean climate areas. This update, along with corresponding suggestions for other climate zones, can also be found at Pip Australian Permaculture Magazine around the start of each month. The Permaculture ‘zones’ described below can be imagined as concentric circles, starting from the home and working their way out through the most intensively managed garden areas, orchard space, native garden and semi-wild areas, to finally reach (in an ideal world) untouched natural spaces…although in this urban jungle, the edge of the school oval might be about as wild as it gets. We’ve had a few proper cold nights here at last – it doesn’t take long for everyone to pine for summer again, in spite of how long the last one dragged on! Short days mean little time spent out in the garden, more time planning indoors…in our case still refining the chookyard design to accommodate kiwifruit vines to grow over it for shade. Still harvesting bright, crispy salads but not much planting lately. Digging the newly made compost into the raised garden beds at the front ready for spring and planning to grow solanum crops here, now that the beds have had a couple of years’ break from this family (tomatoes, capsicum, chili, eggplant, etc). They can be started in containers indoors or in a greenhouse or cloche from late August/early September and then planted out when the ground has warmed up nicely (if in doubt, give it the bare bottom test). No point in jumping the gun as the later seedlings will overtake the earlier ones in the more favourable conditions. Out the back, kale, parsnips, garlic, mustard and potatoes suddenly put on a growth spurt while we went on holidays for a week, as well as a few sneaky tomatoes from the compost – probably cherry ones – enjoying a bit of reflected warmth from the light fence to their south. Normally I’d remove them in the interests of crop rotation in a vegie bed, but it’s about to be converted to a fruit tree bed anyway so they can have their way for now. As the weeds come out (lots of thistles = happy chooks and very yellow yolks! ), veg seeds can take their place – e.g. beetroot, carrots, brassicas, peas, potatoes (certified seed potatoes), the last of the garlic (cloves buried thumb-depth with the pointy end up), parsnip, radish, rocket and spring onion. 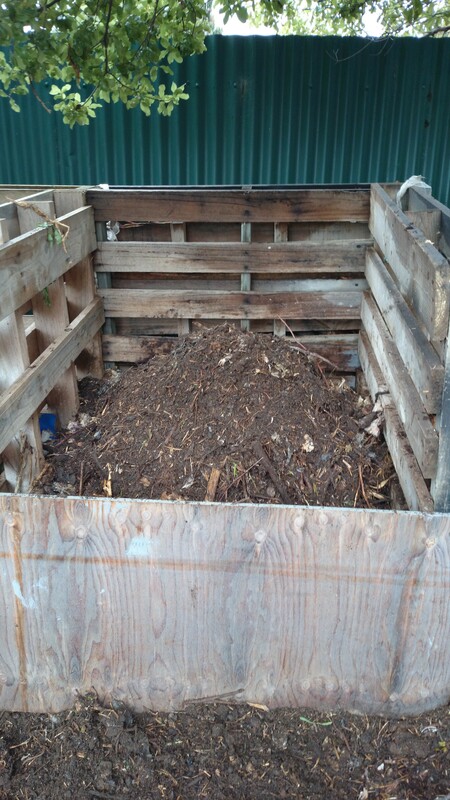 The compost has now pretty much broken down, losing all its smell and colour, but with some larger pieces still identifiable. It could either be left to mature in the heap or buried where it won’t come into direct contact with plant roots until early spring. I’m opting for the latter approach as the digging warms me up! Plenty of rain filtering into the worm farm means that the liquid output hardly needs to be diluted (it’s already weak tea colour) before sprinkling it over the leafy greens and around the citrus trees. It’s time to select my cherry tree and new grapevines for planting soon, while they are still dormant. Also time for deciduous grafting – the Rare Fruit Society of SA (http://www.rarefruit-sa.org.au/) has just had its annual winter grafting sessions with hundreds of varieties on sale, and in Victoria the Heritage Fruits Society will be doing the same in early August: http://www.heritagefruitssociety.org.au/. Bare-rooted fruit trees are lined up in the nurseries ready for planting. Around here where we have heavy clay soil, most trees appreciate some gypsum and plenty of well-rotted compost added to the soil before planting. In sandier areas nearby, replacing the gypsum with a clay slurry will help the soil to hold onto moisture and nutrients more readily, but the compost is just as welcome everywhere. Make sure when planting that the hole is at least twice the width of the rootball, trim off any damaged roots cleanly, and ensure that if it’s a grafted tree, the graft is well above soil level when planted. I soak roots in a bucket of diluted seaweed extract before planting, and then add the liquid when watering in after planting. Templetonia retusa is budding with its brilliant red flowers again already. Wattles are fluffing up, bees are out in force and some days you’d swear it’s almost spring. It’s relatively quiet at the State Flora native nursery http://www.environment.sa.gov.au/our-places/State_Flora – a great time to get plenty of specialist advice – and still good conditions for planting out most local native species. The Friends of the Botanic Garden also run a monthly native plant sale at Mt Lofty Botanic Garden – next one on 24th August – see the plant list: http://media.wix.com/ugd/2a360a_49ca33d1e8234d52831874c17f0f9e0a.pdf. National Tree Day saw local schools and community groups getting into the revegetating spirit. In spite of the promo shots of advanced trees going into the ground every year though, it really does make more sense in a home situation to buy inexpensive tubestock (seedling trees) and to get more of them, as they recover from the transplant shock so quickly and put on rapid growth the following year, potentially giving you a lot more biodiversity for your buck than their older cousins. It also makes sense to use sturdy tree guards, weed the surrounding area and keep it well mulched in the coming months – not sprayed with herbicides! I was saddened to see a recent reveg project on our holiday that had been wiped out by well-meaning poisoning of the surrounding grass. This entry was posted in clay, permaculture principles, planting, soil, vegetables, weeds, winter. Bookmark the permalink.